Electric tape fence also has weaknesses! It is so effi cient that once it is installed you are inclined to think that all your fencing problems are solved. The most important ways to make sure fences are secure is to check them regularly for trouble spots. Use a fence tester to check your fence and check the voltage on a regular basis to ensure at least 3000 volts on the fence line. Without power your fence is just a tape fence, and after eating the grass under it without getting zapped, the horse will soon realize there is nothing to keep him from leaning further and further out, ultimately breaking the tape. So leave the power on at all times to keep your horses safe. 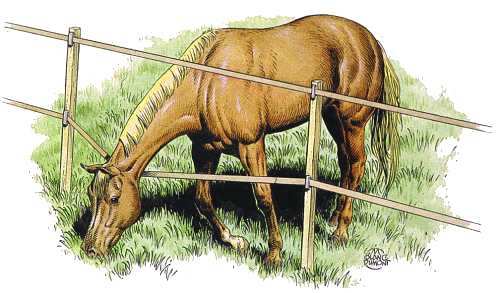 Check your fence tape and the connections regularly to discover and fix the problems before your horses get loose. 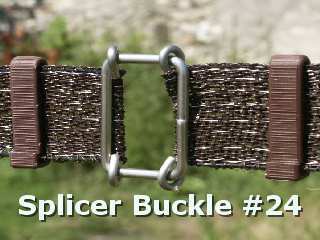 Keep the fence tight and re-stretch it if necessary, the wind flutter can break the wire conductors in a sagging tape. Look for broken insulators, broken tensioners, if any, do not hesitate to replace them. Inferior and cheap insulators that don't maintain the tape properly will en up cutting the wire conductors making the electric fence ineffective. Checks the batteries: the batteries might need to be changed and often it is so obvious, it doesn't come to mind. Check the fuses. If they are blown replace them. If they blow instantly, the charger has to be serviced where you purchased it. Make sure that you have selected the charger with the maximum energy for your circumstances. The impulse energy has to be more than 1 Joule output for small fences and more than 5 Joules output for long ones. directly to the post ! 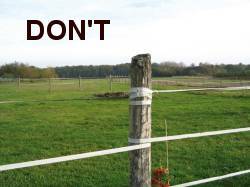 The electric tape fence should not touch anything, including vegetation, metal or wooden posts, apart from the insulators, tensioners and insulated posts. Don't forget to always turn the charger off before servicing your fence. Regular mowing underneath the tape is a good method. A horse that leans over or through a weak fence may loose respect for it. Use a powerful fence charger that can sustain power even with such losses of power. Install the tape high enough above the ground but low enough for horses and ponies not to creep under it. A happy medium is somewhere between 20" and 28". Keep vegetation away by mowing or once a year, use a weed killer. It is difficult to avoid bird droppings and spider webs along the fence line. Birds may run along the fence, and their droppings are so acidic that eventually it will eat through the stainless steel threads. One solution is to use fiberglass posts to reduce invitation for birds to perch. Spider webs can be removed easealy, but there will be less spiders along the fence with a good weed and local shrubbery control. Although your fence charger is usually protected with a fuse, it is always better to turn off the fence when there is lightning or an electric storm. Lightning is a major cause of fence-charger failure. Immediately after a storm, inspect your fence to make sure it is in good shape. A fallen tree might have flattened your fence, opening up an escape route before you realize it. In the event of a broken tape, release enough tape from tension to allow slack and use the splicing buckle #24 to reconnect the ends together. Check the dampness of the ground. About 90 percent of all electric fence problems are due to poor grounding. 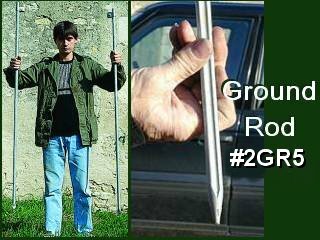 When the ground is frozen or too dry it is very difficult to obtain a good connection . To prevent that problem, it is wise to have a separate paddock for snow or for extreme drought conditions using our unique Bi-Polar Tape system created specifi cally to address these issues. The perfect solution is our Bi-Polar â€œPaddockâ€� Kit (page 44) that needs no grounding and will give you a true year-round fence system.